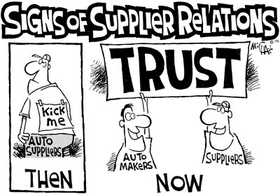 The evolution of the relationship between auto makers and their suppliers has improved vastly in recent years. While in the past, everything seemed based on price, today the key themes are trust and relationships. Three high-level automotive purchasing executives interviewed for a story in this issue made it clear they are looking for suppliers who are in it for the long run. That often means that the suppliers need to spend years striving for and attaining top supplier awards from their car company customers. In turn, those suppliers gain earlier access on projects and the trust that goes along with that. It is key, too, that these auto company officials said the recession didn't change the relationship aspect of doing business. In fact, they looked at finding better ways to communicate with suppliers. Chrysler, for example, held town hall meetings that still continue so the firm makes sure it communicates its expectations clearly. The Detroit-based car maker uses the forums to receive feedback as well. The firm said that not long after it emerged from bankruptcy, its suppliers put forth 400 items they thought Chrysler needed to work on, and the car maker did just that. That doesn't mean some of the basics will change. Safety, quality and delivery performance are necessities for all who want to do business with auto OEMs. And with the major recalls in recent years—including the General Motors ones this year—the expectations placed on suppliers will be even greater. Of course, pricing always will have a place, depending on the part. For those deemed basic commodities, the auto firms will go with price. But for projects in early development, cost structures aren't yet in place, so both sides must trust that a fair price will be reached in the end. Now that's change worth working for.